What is a Log Rule? Since the first sawmill was built in the United States, over 100 log rules have been developed, using a variety of methods. Some were based upon the lumber tallies of individual mills, others were developed by diagramming the cross-section of boards in the ends of logs, while still others were developed using mathematical formulas. In general, log rules must account for the taper that exists in all logs, saw kerf (or the loss of wood as sawdust), and a fixed procedure for removing wood on the outside of the logs for slabs. The Doyle, Scribner, and International log rules are probably the most widely used rules in the eastern United States. The Doyle Log Rule, developed around 1825, is based on a mathematical formula and is widely used throughout the southern United States and is considered the standard in our Midwest locale. This rule allows for a saw kerf of 5/16 inch and a slabbing allowance of 4 inches, which is about twice the normal amount. Because of this, the Doyle Rule is somewhat inconsistent; it underestimates small logs and overestimates large logs. Note: In our area, the Doyle Log Scale is most commonly used. The Scribner Log Rule, developed around 1846, is a good example of a diagram rule. It was created by drawing the cross-sections of 1-inch boards within circles representing the end view of logs. A space of 1/4 inch was left between the boards to account for saw kerf. The Scribner Rule does not have an allowance for log taper and typically underestimates logs, particularly if the log length is long. The Scribner Decimal C is a different form of the Scribner Rule; it rounds the volumes to the nearest 10 board feet. 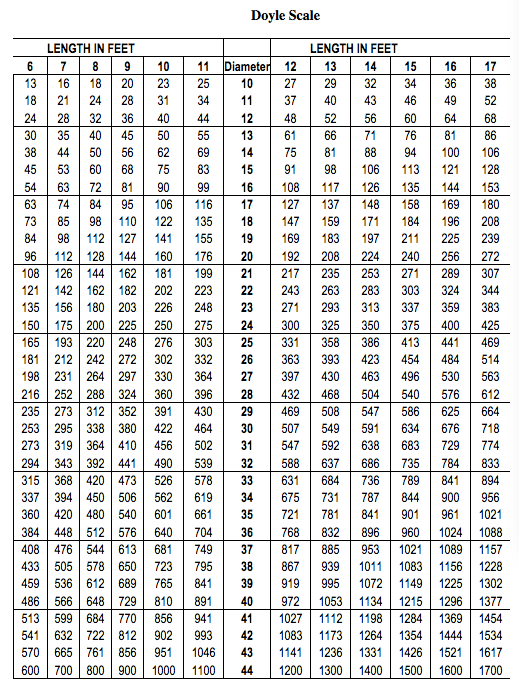 For example, 392 board feet on the Scribner is equivalent to 390 board feet on the Scribner Decimal C scale. This rule was developed in 1906 and is based on a reasonably accurate mathematical formula. 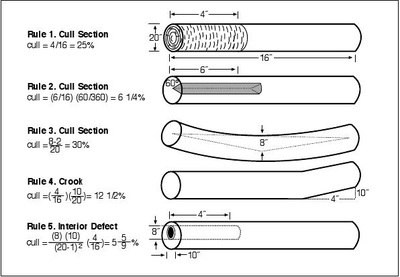 The rule allows for a 1/4-inch saw kerf and a fixed taper allowance of 1/2 inch per 4 feet of log length. 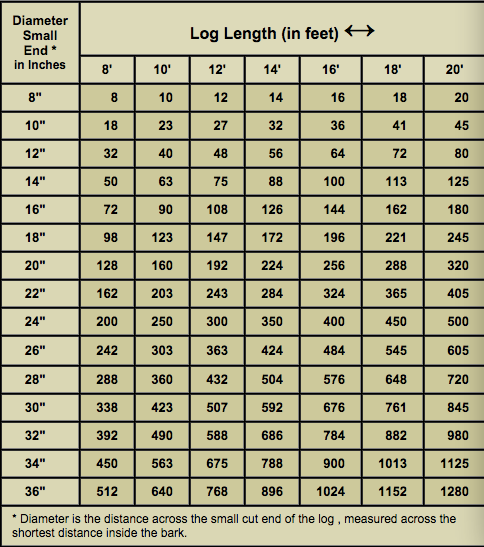 Deductions are also allowed for shrinkage of boards and a slab thickness that varies with the log diameter. Overall, the International 1/4-Inch Log Rule is the most consistent and is often used as a basis of comparison for log rules.